I buddy-read this book with Simant, the lovely blogger behind Flipping Through The Pages. Both Sim and I adored this book and have been waxing eloquent about it ever since! 1. I know how much you loved Molly. I remember you saying that she was so relatable to you. Can you tell how and why? Molly Peskin-Suso is a very memorable character for me. I was able to relate to her so bad. She’s had 26 crushes before and has done nothing about them. Her insecurity about her weight stops her from putting herself out there. Oh and she’s Harry Potter trash, just like my precious little cinnamon roll, Simon Spier. Unrequited crushes. Weight issues. Potterhead. 2. I loved the changing dynamics of Molly and Cassie’s relationship. I liked the ups and down in their relationship. What do you think? Do you think it’s realistic? I believe Molly and Cassie are one of the most realistic sisters in fiction. I may not be a twin, but I do have a sister and I think Albertalli has got sisterhood down pat in this book. Both Molly and Cassie equally love and are miffed by each other in the book, and that’s exactly how having a sister is! 3. Oh and I loved their mothers. They were so.. adorable? What do you think? Who was your favourite out of Patty and Nadine? Ugh, I can’t pick! I loved both of them equally! They’re such great role models. Also, I really loved how diverse this book actually is. Molly and Cassie are IVF babies raised by two mothers, one of whom is black. And they’re Jewish! Albertalli really has done a great job with representation. 4. I adored Reid. He was definitely weird in the beginning but I think his character got a lot of development throughout the story. And all the Game of Thrones fandom? I was sold. What’s your thought? I absolutely loved Reid, right from the page he was introduced in! He’s so adorably awkward and goofy. I didn’t know Molly and Reid was a ship I needed until I read this book! And don’t even get me started about all the fandoms he’s in! I love me a good nerd and Reid is one of the best. 5. What do you think of Will? I think I liked him too. In my opinion his character was important to give Molly that final push. Will was okay; I didn’t care for him as much as I did for Reid. But he’s important to the story. I initially was worried this book would descend into one of those annoying YA love triangles (as far as tropes go, love triangles are the WORST), but it didn’t. The Will-Molly-Reid storyline wasn’t dramatic and was more natural and realistic. 6. This book had many other themes. My favorite was the changing dynamics between the family members as they start giving priority to others. Did you like this theme? Which was your favorite? I really liked how family was portrayed in this book, but my favorite theme was definitely the diversity! As a person who reads a lot of mainstream American fiction, I found this book to be a breath of fresh air. There are gay, straight, pansexual, Jewish, and African American characters. And none of this was forced! It wasn’t representation for representation’s sake. That’s what I really like about Becky Albertalli’s books. 7. Finally, the theme of the book. Unrequited love. How well do you think Becky delivered the message? 8. I personally hate this question, as we discussed it too, but I’m just asking it for fun. Which book did you love more: Simon or Unrequited? Why? Haha, Sim, why, why would you make me do this? Anyhoo. They’re both different stories and I believe they shouldn’t be compared. I know a lot of people like Simon over Unrequited, but I like both books equally! 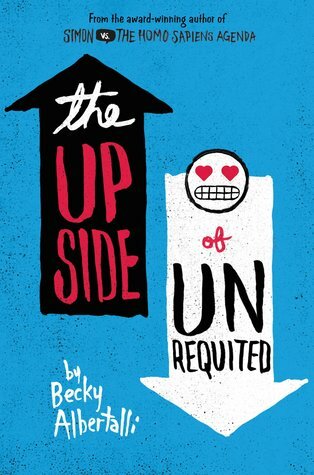 I think I liked Unrequited more than the average reader because of how relatable Molly is. And I liked Simon because, really, what’s not to love in that book? Check out Simant’s answers to my questions here! Reading with Simant was amazing and I can’t wait to do it again! We’re going to be reading Leah on the Offbeat together soon. Watch this space for more details! Next Post May 2018 wrap-up: What did I read, write, and do? Heyyy I’m reading this now!😀 It’s great so far and I’m not sure which is gonna be my favourite- this or Simon vs.
Oh and have you read Leah the offbeat? Ooh, I love this book so much! It was just so funny and sweet, and honestly I could relate to Molly so much! Like, we didn’t actually have much in common, but she just felt very… me-ish. Amazing post! I CAN’T WAIT UNTIL I PICK THIS BOOK UP !! Looking forward to your post about Leah on the Offbeat! So just to say it again, I really loved reading this book with you and yeah can’t wait to read Leah either. But hold on for a few days 😛 Promise, I will buy it soon. I loved the whole diversity thing too. I mean I never understand properly all these sexual classifications but I am glad that now I know what a Pansexual is. I swear I’ll never buy books again this year. I think. Haha. Oh wait, do you only have 7 unread books at home? Like really? How? 😱 Tell me your trick girl.